I’m hoping most of you have at least heard of heartworm (if not then we, as a clinic, are not doing a very good job!). More than likely, most of you have probably sat in the appointment room at the vet clinic and been lectured by one of us, our tech or other staff members about the “dangers of heartworm“. There is A LOT of information out there about heartworm and without getting into the lifecycle of the parasite, it is very hard to know what is truth and what isn’t. Heartworm is a blood parasite. The parasite prefers dogs, but infections have been seen in wolves, coyotes, raccoons, foxes, cats, and even people in very, VERY rare cases. The transmission of heartworm starts with a dog that is already infected. 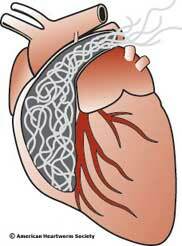 Adult heartworms set up shop in the heart and surrounding large vessels (main pulmonary vein) and start reproducing. The larvae float freely through the dog’s blood stream and are referred to as “microfilaria”. 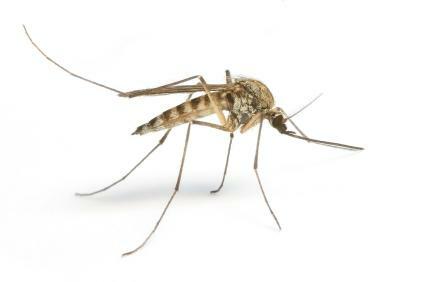 When a mosquito bites an infected dog, microfilaria move from the dog’s blood stream into the mosquito where they mature to their next life stage. The mosquito flies around incubating the heartworm and when it bites a new dog, the microfilaria leave and enter the skin of the new dog. The larvae then travels through the skin, making its way to the blood stream where it will travel to the heart and mature into an adult worm and the cycle starts all over again. It takes approximately 6-7 months from infection to have the worms mature and start producing microfilaria – this is important when it comes to testing dogs for heartworm. Sitting in the large vessels, adult worms take up room and block blood flow. They act like a clogged artery and dogs develop signs of heart failure and lung disease. If caught early and treated successfully, the damage can reverse, but if left undiagnosed, the heart and vessels will have incurred enough damage that the heart disease can’t be fixed, even if the worms are killed. 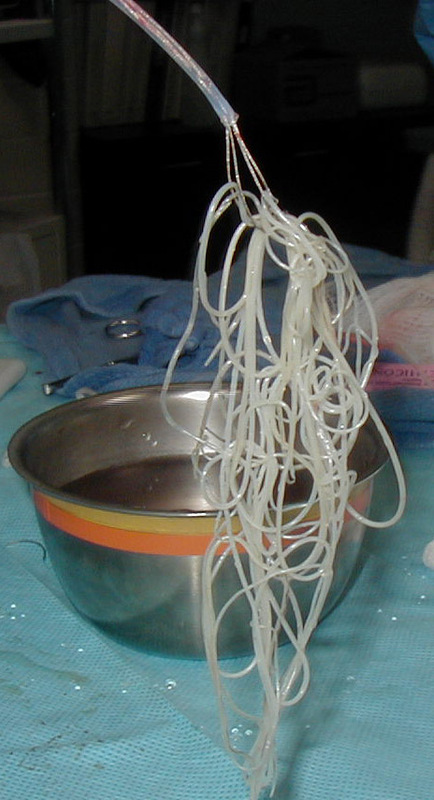 Treatment for a heartworm positive dog is long, risky, and expensive. Killing adult worms and circulating microfilaria causes (for lack of better terminology) dead worm pieces to break off and they have the ability to form clots in the dog’s body causing tissue damage. Successful treatment is possible but, because of the risk for complications and expense, most vets recommend using preventatives to prevent the risk of infection all together. So… heartworm infection sounds bad right? I hope I got that across – It is bad news for dogs. So, why the controversy on testing for it and giving dogs preventatives? The main reason is that heartworm prevalence varies immensely depending on where you live. Warm, humid climates like Florida, New Orleans, and Georgia have a huge population of infected dogs and infected mosquitoes. It is warm all year round so they don’t have the die off of mosquitoes in the winter like we do. Dogs MUST be on heartworm protection in these areas. Many rescue dogs that came up from the Katrina disaster relief effort came up heartworm positive. In the prairies (Alberta), they don’t see heartworm disease at all. They rarely test or use preventatives unless the dog is traveling to at risk areas. Their summers are short and winters too harsh for anything to survive. Ontario is in-between. Northern Ontario doesn’t see heartworm really, but the GTA and Niagara regions can. South of the 401 especially we see pockets of heartworm positive mosquitoes. Populations of infected stray dogs (or untreated dogs) are a constant source of infection for our mosquitoes, who can then infect our pets. The preventive works by killing the parasite before it gets to the heart. It’s a bit counter-intuitive but we aren’t preventing the heartworm from getting into the body, we are just killing it once it’s there. That’s why the last dose of preventive is given AFTER you see the last mosquito of the season. The dates change a little each year depending on our crazy weather, but giving the last dose November 1st makes sure that no mosquitoes can infect your pup. We then do the heartworm test the next spring to make sure nothing got through from the previous season. We can decrease the prevalence of heartworm in our area if all the dogs are on heartworm preventative and are getting tested. If there are no positive dogs to infect the mosquitoes, they can’t spread the parasite. This makes prevention a bit trickier. We can’t stop wild animals from getting the parasite and mosquitoes may pick it up from them. The parasite is made to be a dog parasite but will make due with similar species. Cats can get heartworm but it is rare. It seems that the feline immune system may be able to recognize the parasite before it sets up shop in the heart and kill it. Some unlucky cats will get heartworm disease, and show clinical signs (usually respiratory problems) but even with adult heartworms it is rare to find circulating microfilaria – cats can rid the microfilaria from their body. So, there may always be pockets of infected animals and mosquitoes and this is why we recommend that all dogs be on a preventative. The preventatives are safe, and very effective. Luckily, our winters kill off our mosquitoes for 6 months of the year so we only need to use the preventative during mosquito season – June to November.